The average personal loan size is just over $7,500 and at a rate of 24% a year. That means payments of $294 on a 36-month loan and paying nearly $3,100 in interest. Personal loans helped me claw myself back from financial ruin a decade ago but making those payments can be a tough situation to be in for three years. Even if you’re able to scrape by and make those payments every single month, who wants to lose over three grand to interest on a loan? One of the best things about personal loans, besides helping you get back on track financially, is that they can help rebuild a bad credit score. While paying off my peer-to-peer loan, I found one trick that uses that benefit to lower my payment and save thousands in interest. 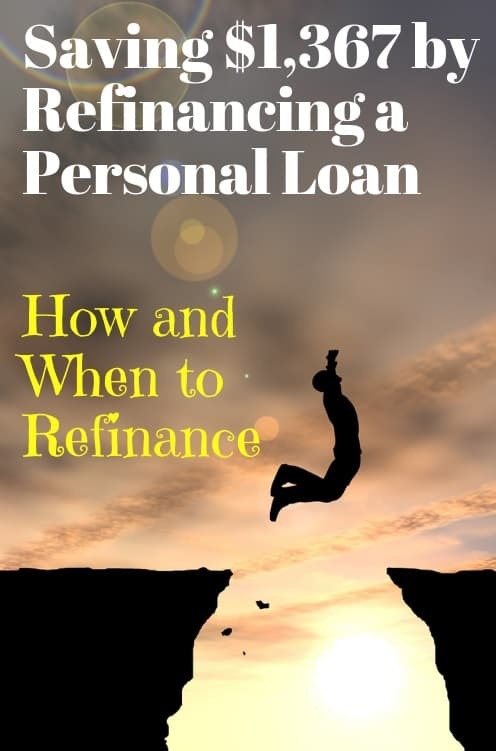 I want to share what I learned about refinancing a personal loan and the process I used. Is it a Good Idea to Refinance a Personal Loan? Anyone following the blog for a while knows my story of financial meltdown in 2008, how mistakes in real estate investments nearly bankrupted me and caused my credit score to plunge to 560 FICO. I had tens of thousands in credit card debt at an average interest rate of 24% and there was no way I could continue to make the payments. I was able to take out a consolidation loan at a lower rate to pay off the credit cards. Not only were the payments more manageable but I was saving money on interest every month. That was the immediate benefit of a personal loan. Switching the debt to non-revolving, paying it down and making regular payments quickly produced another benefit though, a higher credit score. Within 18 months, my credit score was more than 100 points higher. That’s when I started looking into how to refinance a personal loan and potential benefits. 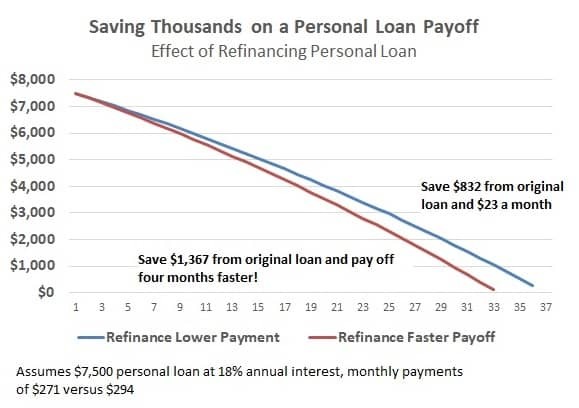 Because you know I’m all about the math, let’s look at the benefit of refinancing a personal loan on that average amount. Refinancing a $7,500 loan with a 24% interest rate into another loan on an 18% interest rate would mean payments of $271 a month. That’s already a savings of $23 a month and $832 in interest. On the other hand, if you were to refinance your loan but still make those same $294 monthly payments, you would save over $1,300 in interest and pay the loan off four months faster. Should I Refinance My Personal Loan? I used 18% as the interest rate on a loan refinance because it’s one most borrowers can get with a little work on their credit score. I was actually able to get an interest rate of 14% on my p2p loan refinance which meant much larger savings. Refinancing a personal loan isn’t without it’s drawbacks. Most personal loan sites charge an origination fee of around 5% of your loan which will eat into your savings. That means you want to make sure your new rate is going to be low enough to save money even after the fee. When Can I Refinance My Loan? Once you’ve decided on refinancing your loan, the only question left is when. Most peer-to-peer loan sites don’t like to see a new loan application within a year of your previous one. That’s usually not a problem because your credit score likely isn’t significantly higher by this time anyway. That’s fine. It will take some time for those monthly payments on your personal loan to start rebuilding your credit history. That combined with some other credit score hacks will gradually boost your FICO to the point of enjoying big savings when you finally do apply for a refinance. We’ll go over the process of how to refinance a loan later. While there’s no rule about when to refinance, I would say it’s usually at least 18 months after your original loan. That’s when I refinanced and most of the people I’ve talked to that have completed the process have refinanced around that time. You want to start watching your credit report and trying a few tricks to increase your score as soon as possible. Many of these credit hacks take a few months to start working. From a year after your original loan, check your credit score to see how much it’s increased. A lot of credit cards will offer a monthly update on your score as a free service. When you start applying for a refinance loan will depend on your score when you got the first loan and how much it’s changed. I’d say if your FICO was under 650 then start thinking about refinancing once you reach 680 FICO or higher. That’s the cutoff for what’s called prime-lending and the point where you’ll really start seeing lower rates. What about Other Loans like Refinancing Auto Loans? I’m talking about refinancing a personal loan because that’s what I did but you can refinance any loan including a car loan. When most people say refinancing an auto loan, they think about refinancing it through a dealer or bank. What we’re talking about here is refinancing with a personal loan so you can use the money for any purpose. You can use a personal loan to refinance anything including car loans, credit cards and even other personal loans. You generally wouldn’t use it to refinance a mortgage or student loans because the rates on these will usually be lower than what you’ll get with a peer-to-peer loan. I feel like I need to point out that you absolutely must use your new personal loan to pay off the existing debt. It sounds like a no-brainer since we’re talking specifically about refinancing but you’d be surprised how many people see that new money in their bank account and start making big vacation plans. With those basics, the actual process to refinance a personal loan is surprisingly easy. Check your credit report and score at least six months before thinking about refinancing. Dispute any bad credit marks and try to negotiate other mistakes with creditors to get a quick boost to your score. Within 18 months of the original loan, your credit score should have increased at least 50 points if you paid off the prior debt and have been making regular payments. List all your debts in order by highest interest rate first. This will give you an idea of which to refinance depending on your new loan rate. Check your rate on at least three personal loan sites to see which offers the lowest rate. I recommend PersonalLoans, Upstart and SoFi to start. Most websites are flexible on the length for your loan. You have two options here when refinancing your old loan. Spreading out the loan over 36 months is going to lower your payment more but it will also cost more in interest. Your monthly payment should still be lower even if you take a new loan only for the time you have remaining on the original because of the lower rate. If you do decide to spread the new loan out over 36 months of payments, try to still make extra payments on the loan when you can. Personal loans can be a great financial tool if used correctly. Likewise, a loan refinance can help you save money and pay off the loan faster but you still have to use it correctly. Refinance a personal loan and reap the benefits by sticking to your budget even with those new lower payments. Make extra payments on your new loan, save interest and get your finances back on track.